A story of courage and love, a voyage of romantic drama, determined hearts, faith in God, fearful odds and a fabulous happy ever after. Western Mail Order Bride romance at it’s thrilling best! 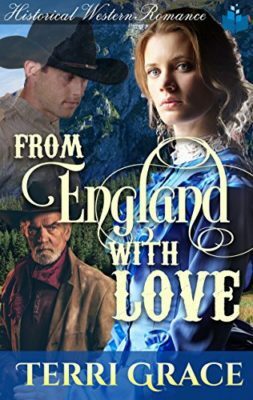 Seeing her sister suffer at the hands of a man who treats the woman he should cherish more like a possession, 18-year-old Audrey Woburn determines that she will only ever marry for love. She is ready to brave raging seas to find the love she seeks. With prospects scarce in Victorian England, she decides to leave for America in search of the man God has prepared for her. A shocking case of mistaken identity lands Audrey in Arlington, Texas, and before she knows it she is soon married to man she scarcely knows. When the woman whose identity Audrey has assumed turns up, determined to break the fledgling marriage and claim what’s rightfully hers, Audrey fights for the love she knows is possible. A desperate letter to her sisters in England might just bring the help she needs. A story of courage and love, a voyage of romantic drama, determined hearts, faith in God, fearful odds and a fabulously happy ever after!